To an inner-city child from New York City, something as simple as a quarter-acre lawn in Fairfield may represent unknown freedom to play outside and not worry about a thing. When 10-year-old Moses, a Fresh Air Fund child from the Bronx, N.Y., arrived at the Fairfield home of Erin and J.R. Hermann last summer, he didn't want to rush off to do anything fancy. He was in awe of all the blades of grass on the Hermanns' two-acre property. "He wanted to go barefoot," said Erin Hermann, who added that he marveled that he could be outside by himself without an adult with him. Moses is one of approximately 5,000 children who will stay with volunteer host families in suburbs and small town communities across 13 states and Canada this summer. Children are selected to participate in the Fresh Air Fund's programs based on financial need, and they are registered by more than 90 social service and community organizations in all five boroughs of New York City. Many children, like Moses, just don't see grassy lawns, and a pool is often a foreign sight to them. When Moses told the Hermann children, ages 10 and 12, he had never seen a pool before, they were shocked. "I think for a lot of these kids, the TV is the baby sitter," Hermann said. 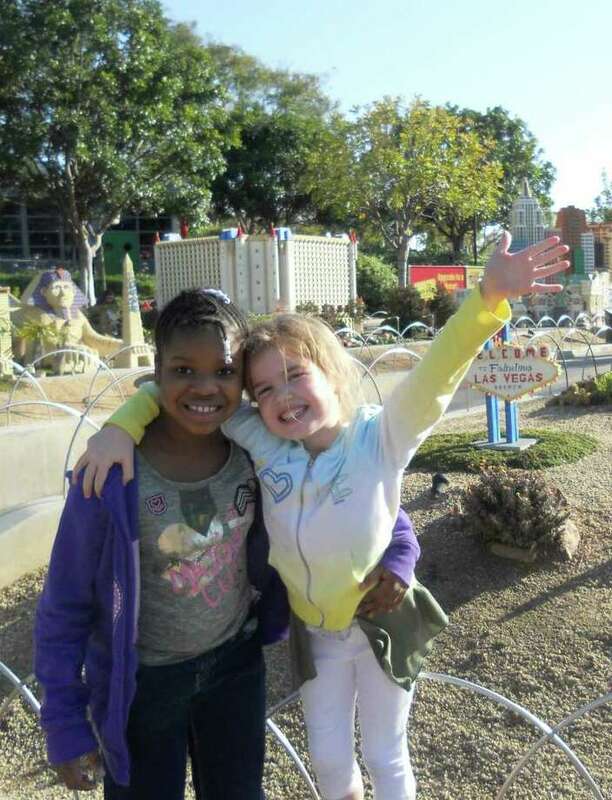 While it might be tempting to want to take an inner-city child to Six Flags, Hermann said the Fresh Air Fund children don't need the bright lights, whirling rides and cotton candy to be happy. Moses, she said, is more than happy tagging along on a trip to the grocery store. Westport residents Edward and Susanne Martin have hosted 12-year-old Daynna from the Bronx, N.Y., since 2009. "It's just sort of our mission," said the mother of two daughters, ages 9 and 11. "A lot of people go to Africa or Guatemala (and help out the locals), but this is something we can do, give of ourselves, but really, we get more out of it than we give." Martin said she was moved one time when she opened up a piece of mail and it was a figurine of an angel, sent from Daynna. An accompanying note said Martin was her angel. Fairfielders Yvonne and Stephen Zeisler last year hosted 10-year-old Bronx resident Keelan, as he is close in age to their son Ben, age 9. He will also stay with the family this summer. "It's a good learning experience for my children because they see that not everyone has what they have," said Yvonne Zeisler, who hosted a Bronx girl some years back. "There are certain things they take for granted, like our yard and our food." Keelan got to do a lot last summer, but more than anything, his favorite thing was visiting the Sherwood Farm, with its three cows and countless chickens, Yvonne Zeisler said. "He loved feeding the cows," she said. "He had never seen a cow before." Keelan was also happy just playing outside, playing with Ben's toys and swinging on the swing attached to a tree in the family's yard. "You can do so little to make a difference in someone's life," she said. "You don't have to do anything extravagant." Barbara Hennelly, a single mom from Westport, has hosted 7-year-old Chyna from the Bed-Stuy section of Brooklyn since 2009. This past winter, she took Chyna to the Christmas Spectacular show at Radio City Music Hall and on a family vacation to San Diego in February. "She listens to me, sometimes better than my own daughter," she said. "She cleans up after herself. She's a joy to be around." Part of the reason Hennelly chooses to be a Fresh Air Fund host is so her daughter Maggie, 7, doesn't grow up to be a spoiled single child. While Maggie is white, and Chyna black, the two youths don't see their color differences and Maggie now calls Chyna her sister. Chyna's mother, Tanine, also appreciates all that Hennelly does and calls Hennelly Chyna's second mom. Chyna loves being able to play outside when she's in Westport, Hennelly said. "Every time she comes here, she said, `It's so green,'" she said. "I feel like I'm doing something good for another human being." Weston resident Martha Mintzer, the local chairperson for the Fresh Air Fund, also is a host. She and her husband have hosted various children and even taught one child how to swim in as little as three days. "This is why I love doing it," she said. "You see the smiles on their faces. The impact is very immediate." Families interested in becoming Fresh Air Fund hosts should call Mintzer at 203-226-6627 or email her at martha_mintzer@yahoo.com.